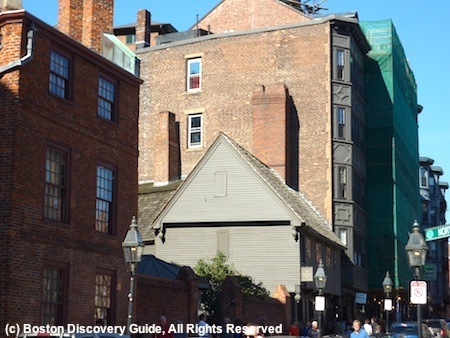 Exploring the North End, Boston's oldest residential neighborhood, takes you through streets first settled by the Puritans. 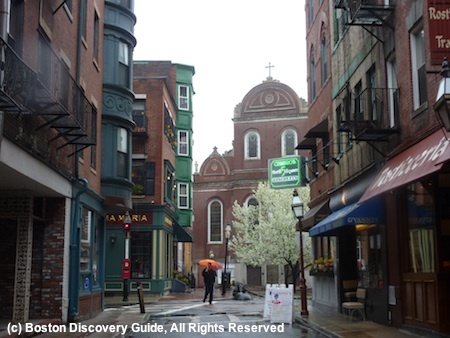 Later, waves of Irish, Portuguese, and Jewish immigrants made the North End their home. 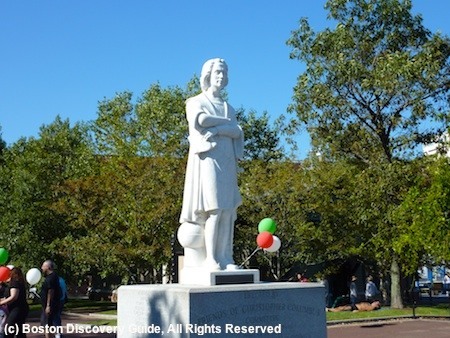 Finally the Italians arrived throughout the 20th century, giving the neighborhood the wonderful restaurants and cafes, saints' feasts and festivals, and Columbus Day celebrations that attract so many visitors today. 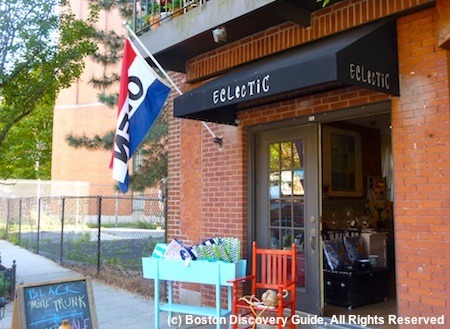 You'll find today's North End filled with old buildings dating from 100 or more years ago, sleek condos, stunning waterfront views, Freedom Trail sites, gorgeous parks and green spaces, and interesting boutiques and food shops. 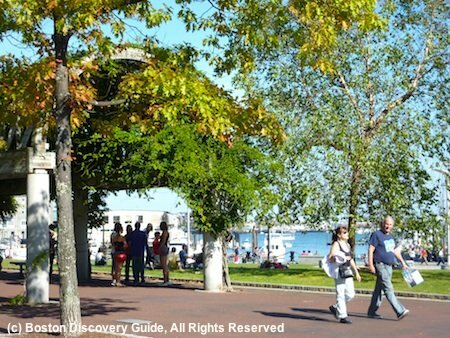 Stay in neighborhood hotels to savor life in this unique part of Boston. 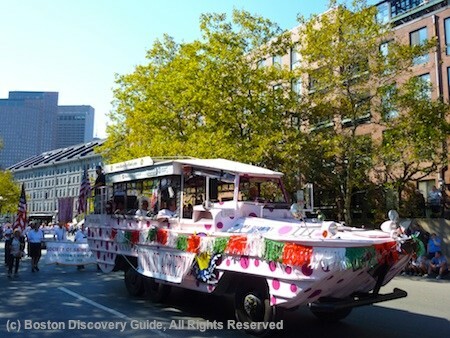 Columbus Day Parade - The colorful Columbus Day Parade honors Boston's Italian heritage and features floats, marching bands, military groups, and entertainment - one of Boston's best parades! 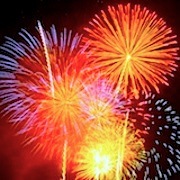 Saints Feasts and Festivals - The North End turns into a giant street party on almost every summer weekend as residents celebrate different saints with huge feasts and festivals, as they have for the past 100 years, following traditions dating back to Italy. 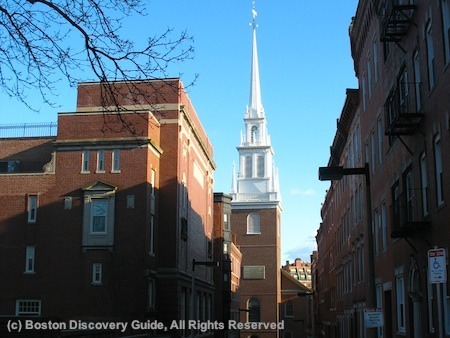 Old North Church - In 1775, on the eve of the American Revolution, Paul Revere arranged for lanterns to be hung from the steeple of the Old North Church to signal the path the Redcoats would take on the eve of the American Revolution before he left on his own midnight ride to alert the Massachusetts countryside. 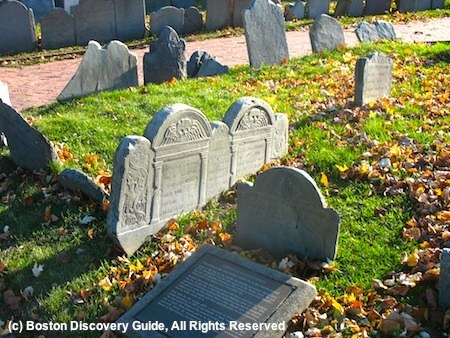 Copp's Hill Burying Ground (21 Hull Street) - You can see plenty of 17th century grave markers with skulls and crossbones here in Boston's 2nd oldest cemetery, dating from 1660. Some gravestones bear pockmarks from musketballs, made when the British expressed their contempt for the Colonists by using this burial ground for targat practice. 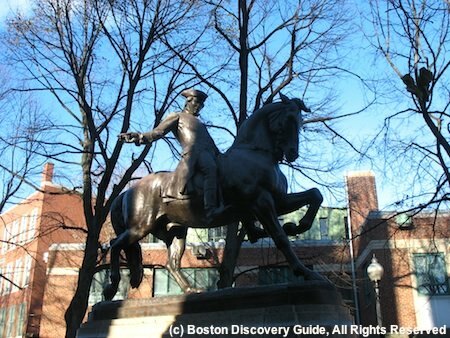 Paul Revere Mall (Hanover Street, near Clark Street) - This small brick-paved walled park, locally called "The Prado," features a wonderful statue of patriot and silversmith Paul Revere on horseback to represent his famous midnight ride. Bronze tablets on the walls document in fascinating detail the lives of other lesser-known North End residents. 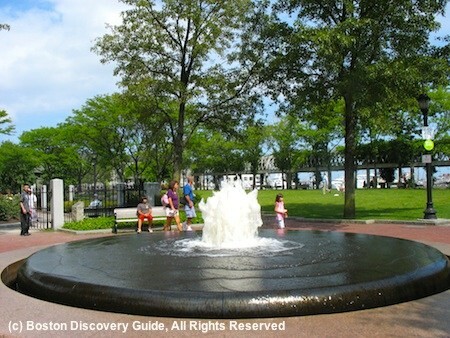 Great Molasses Flood Site - (Puopolo Park, 529 Commercial St) - A small plaque marks the spot of this horrific disaster. Close to Copps Burying Ground on the Freedom Trail. Steriti Ice Rink (561 Commercial Street) - Although this North End ice skating rink offers only limited public skating hours due to all the hockey teams with ice time, it's a lot of fun if your timing is right. No need to bring your own skates; rent them at the rink. 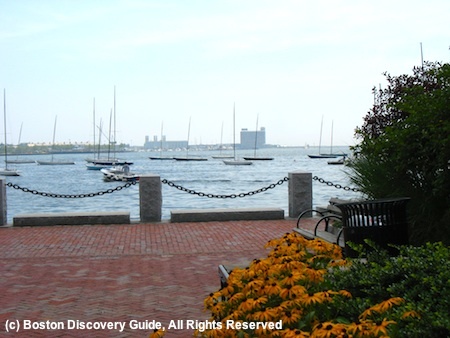 The luxury waterfront Fairmont Battery Wharf is the only hotel right in the neighborhood, as well as Boston's only waterfront boutique hotel. Sweeping views of the Harbor, a top on-site spa, and direct water taxi service from Boston Logan Airport make the Fairmont one of Boston's best hotels. 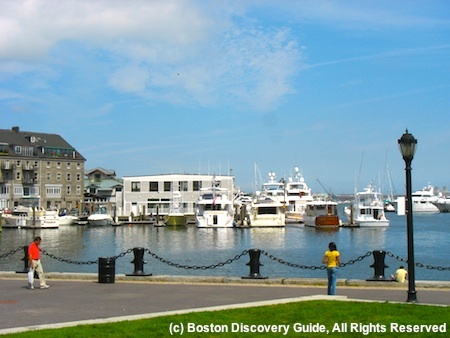 As you can see in the photo, Harborwalk passes by the hotel - perfect for a stroll or early-morning jog. 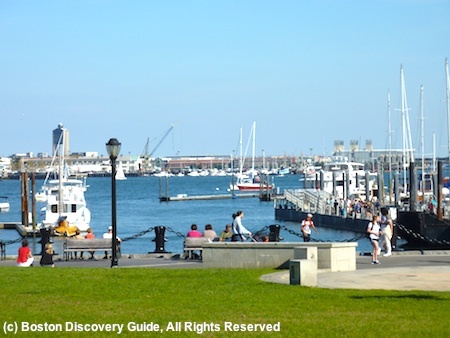 The Marriott Long Wharf's location next to both the North End and the New England Aquarium and across the Rose Kennedy Greenway from Faneuil Hall Marketplace ensures its position as one of Boston's most popular hotels, especially with families. The large indoor swimming pool is one of the nicest in the city, and for more entertainment, head to the IMAX theater next to the Aquarium or out to the Greenway with a frisbee. 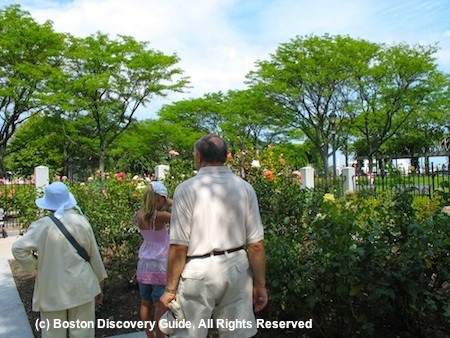 You can easily walk to all of the North End's attractions within just a few minutes. If you're traveling with children, you'll also want to check out the playground in Christopher Columbus Park next to the hotel. The Bostonian Boston is almost as close to the North End as the Marriott Long Wharf Hotel - just a short walk across the Rose Kennedy Greenway. 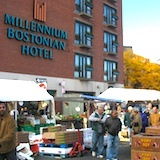 If you want to be near Faneuil Hall Marketplace and other historic Freedom Trail sites in Downtown Boston yet just a few minutes away from the North End, the Bostonian Boston is a great choice, especially because its balconies, gas-burning fireplaces in most rooms, and fabulous Italian linens provide lots of luxury hotel amenities at a mid-range price. 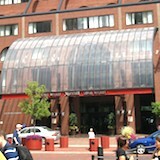 For added interest, Boston's historic Haymarket takes place next to the hotel on Fridays and Saturdays, as you can see in my photo. 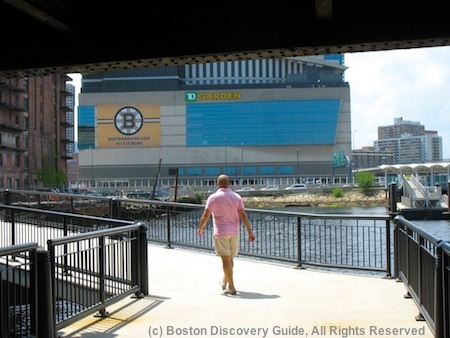 TD Garden is also very close, if you're planning to go to a Boston Bruins game or other entertainment or sports event there. 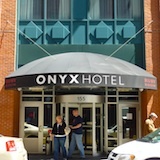 Located just a block away from sports/entertainment complex TD Garden, the Onyx is an easy 5-10 minute walk to the North End, Faneuil Hall Marketplace, the New England Aquarium, and Beacon Hill. If you're planning to go to a game or entertainment event at the Garden, or want to enjoy the sports bars and other nightlife in the immediate area, the Onyx is a great choice, especially because it offers some nice luxury touches and Kimpton's famous stylish decor. Mamma Maria (3 North Square) - Northern Italian cuisine, excellent wines, and a romantic setting a 19th century townhouse in historic North Square. 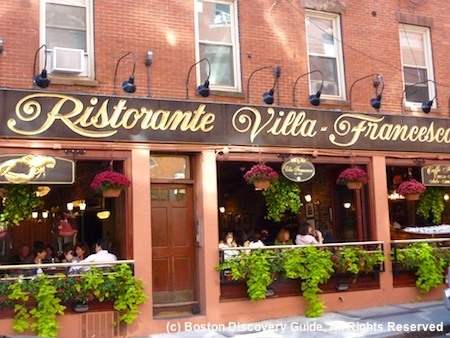 One of Boston's top restaurants, and the only Boston Italian restaurant with a 4 diamond rating from AAA. Cantina Italiana (346 Hanover St., 617-723-4577) - Home-style Southern Italian favorites, cooked to perfection. House-made pastas. Ristorante Fiore (250 Hanover St., 617-371-1176) - Traditional Italian classics, beautifully presented. Charming roof deck dining. Neptune Oyster (63 Salem Street, 617-742-3474) - Terrific raw bar, a Maine lobster roll (one of my top favorites) served hot with butter or cold with mayo, daily specials plus a half-dozen or so seafood entrees. Best cioppino in Boston. Improv Asylum (216 Hanover Street) - One of Boston's best venues for improvisation and comedy sketches; most shows recommended for 17+. Afternoon and evening shows. Goldstar often offers half-price tickets. 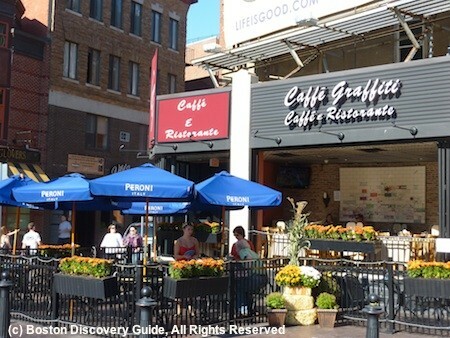 Most North End nightlife centers around the cafes, bars, and restaurants. Walk up Hanover or Salem Streets to find many small, interesting spots. Explore small Italian groceries, specialty wine shops, and clothing and home decor boutiques for unique gifts. 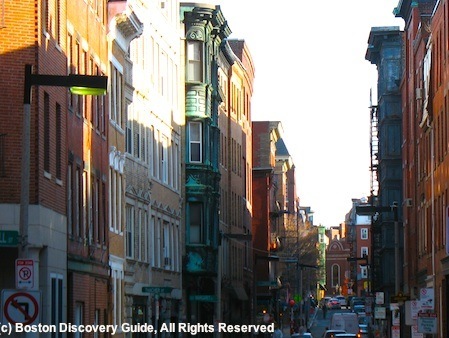 Almost no metered parking exists in the North End, and most streets are almost too narrow to navigate by car. 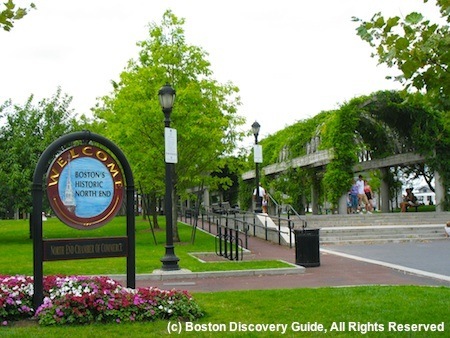 The easiest way to get to this neighborhood is to take the T (Boston's subway) to Haymarket or North Station, and walk across the Greenway. 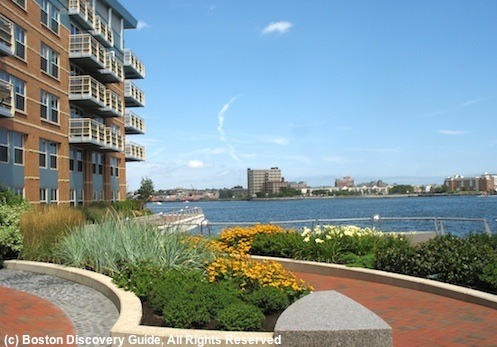 The North End's most arrivals during the last couple of decades have been young professionals, attracted by the central location, the combination of waterfront views, nice parks, and the strong sense of community in the community, and of course, all the great food. At this point, only about half of the neighborhood's residents are Italian or of Italian descent. 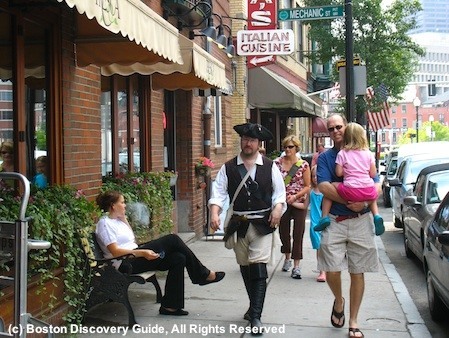 Despite these newcomers and the many tourists who visit the North End, you'll still hear plenty of Italian spoken in the streets. 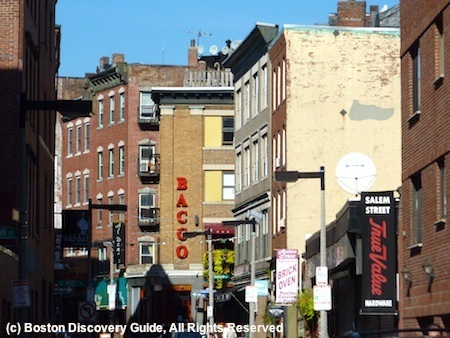 But what you'll NEVER hear is anyone local calling this neighborhood "Little Italy" - Boston locals always say "the North End."